The Department of Town and Country Planning organises an annual international scientific and practical conference Formation of Urban Green Areas (from 2004). A periodical publication of scientific works Miestu želdynu formavimas (Formation of Urban Green Areas) (published from 2004) is published and supervised upon initiative of the department, where scientific articles in the field of technological science are published analysing the problems related to formation of green plantations and environment of the urbanised territories. 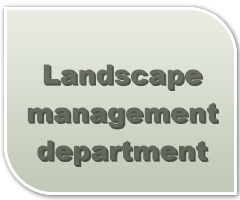 Articles in other fields such as landscape design, green plantation design, landscape architecture, ornamental planting and other technological and engineering fields can also be published. As of 2010 this publication is included into the international database Index Copernicus. Scientific work carried out by the teachers employed in the LD study programme is related to the subjects of general education and the main studies, as well as to ensuring of the quality of studies. The area of research of the department is town and country planning. The department carries out all types of research related to this field. The teachers analyse and research the environment according to the fields of the taught subjects, such as Floriculture, Dendrology, Landscape Architecture, Flower Arranging, Small Architecture and Green Plantation Design. Teachers of the department carry out the continuous research Spatial Analysis and State of the Green Plantations of Microdistricts of Klaipeda City, the results of the analysis of which are announced at the conferences and published in scientific publications, as well as used in preparation of the students’ term papers and final theses. Research carried out by the department personnel according to the taught subject and the scientific area are related to improvement of the study programme and continuous improvement of qualification in the field of the taught subject.